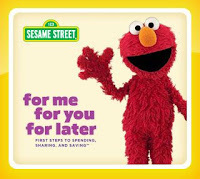 The free bilingual, multimedia kit includes a Parent and Caregiver Guide, a Children's Activity Book, 3 Jar Labels, and an original Sesame Street® DVD that features Elmo, Cookie Monster, and their Sesame Street friends as Elmo learns the basics of spending, saving, and sharing. Educators, download the Educator's Guide that can help easily incorporate activities that build financial skills into your programs. Click the link below to go to the website.